Birds do it. Bees do it. Even wildebeests do it. One by one they gather in big groups - and think and act as one. "It's the idea that the individual members of a herd relate, behave in a similar fashion," said Pat Thomas, general curator at the Bronx Zoo. "And that's so that they don't stand out and appear different than their group mates." "If they act too much out of the norm, more often than not they're singled out and identified by a predator - and don't survive very long." Herds can be awesome, moving and flowing in masses, reminding us that in nature there's the quick - and the dead. And those who stay scared are more likely to stay alive. Fear: It makes animals run in herds. Could it also cause otherwise thoughtful people to stop thinking for themselves and follow the crowd? See-sawing stocks. Rallies and crashes. Investors buying and selling before they've had time to think. "We are mammals, just like the wildebeest in the plains of the African Savannah," said Andrew Lo, who studies emotions and economics at MIT. He says when fear sets in, we have little choice but to behave like animals, using a different part of the brain - what some scientists have called the "mammalian brain." At Emory University in Georgia, Dr. Gregory Berns showed us how the brain reacts to fear. It comes from a part of the brain that's called the amygdala, the seat of the fear response. That is what kicks into overdrive when your 401(k) tanks. "Whether it's the fear of being the odd person out, whether it's the fear of uncertainty or the fear of losing your shirt in the market, the fear starts to compel you to do something, because a million years ago, that fear meant you probably had to run or fight," Berns said. But reactions that saved our ancestors from saber-toothed tigers don't make as much sense on the floor of the Stock Exchange. Financial historian Jeff Madrick says that's how we got into trouble in the first place - by developing the notion that the stock is highly rational. "That encouraged this herd behavior," he said. "People would say, 'The stock market is right. Let's get in here.' 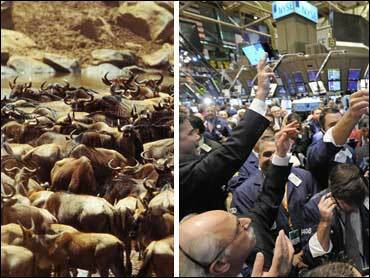 That was the mythology that fed the herd behavior." So the group think that helped build the bubble is now leading the charge to pop it. "I think there's probably a panic now," Madrick said. Berns agreed: "You could call it panic; I would." But the Bronx Zoo's Pat Thomas says, "It's definitely a survival mechanism." "The research that neuroscientists have developed seem to suggest that herd mentality, on the downside - that is, in reaction to panic and fear - is far more powerful than the herd mentality associated with greed - herd mentality on the upside," said Lo. "Because fear trumps greed?" asked Landis. "Fear always trumps greed, that's right," said Lo. "From an evolutionary perspective, it's a lot more important for you to be scared and run away from danger than for you to be excited and happy and thrilled about your life." "It's better to be scared and alive than -"
"- Happy and dead, yeah," Lo laughed. Yes, we may be smarter than beasts of burden, but we're still creatures of habit.